With the high demand of Opening Night and Weekend game tickets, fans are encouraged to buy early. SOUTH BEND, IN - Individual game tickets for the 2019 South Bend Cubs season will go on sale March 6 beginning at 12:00 p.m. ET. Tickets will be available at the Four Winds Field Box Office, by calling (574) 235-9988, and online at SouthBendCubs.com. Fans who come to the box office during their lunch hour will be treated to a free hot dog and bag of Uncle Ray's potato chips, available to the first 100 fans. The South Bend Cubs mascot Stu D. Baker will also be on hand to greet fans and sign autographs. 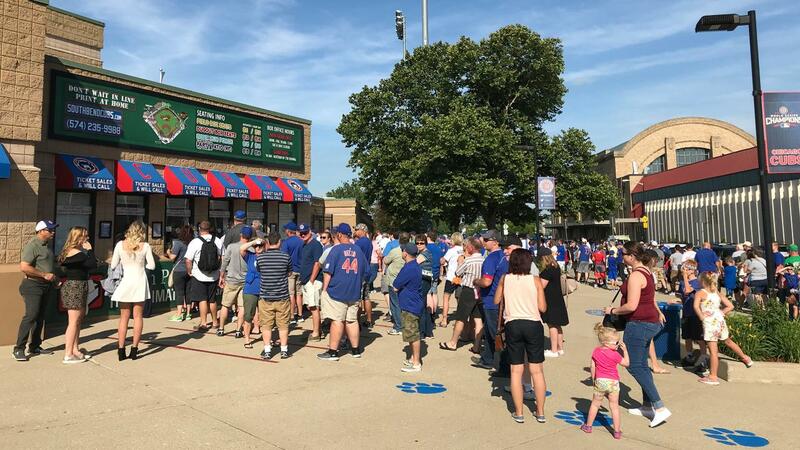 "The excitement we see in our fans every year when single game tickets go on sale is contagious," South Bend Cubs Team President Joe Hart said. "It gets us in the Front Office even more excited for Opening Day. We have so much planned for the 2019 season and we can't wait to share it with our fans and guests." This past season at Four Winds Field, South Bend sold out 40 games. Because of the high sell out rate, fans are encouraged to plan ahead and purchase their tickets early. This is especially recommended for giveaway nights, as well as Friday and weekend games. After drawing 343,763 fans during the 2018 season, the organization's expectations and goals continue to rise year after year. For the first time in two years, the South Bend Cubs will open the season at Four Winds Field on April 4 with a quick two game series against the West Michigan Whitecaps. Gates open at 5:00 p.m. with first pitch scheduled for 7:05 p.m. Opening Night will feature a magnet schedule giveaway and a special post-game fireworks show.